Late winter is one of the most difficult times of year to eat off the land, whether you are a homesteader or native person. But now that we've got a little more possible daylight, and we have passed Equinox this weekend, there is an abundance of wood element, spring tonic, yummy native wild food available for grazing. Today, with our pour nearly all ready, approaching rain, and Saturday laziness, we all decided to go for a creek walk after a late breakfast. 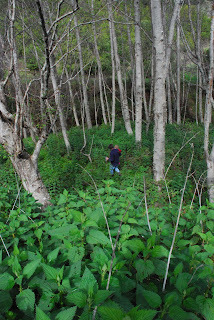 The first plant we encountered was our veritable Stinging Nettle (Urticaria dioica) farm, all along the creek bank. There is so much, we could certainly go into business selling dried herb product, tincture, and the like, all wildcrafted, while not at all diminishing the stocks. It is truly amazing and prolific. Though I didn't harvest any today, Nettles are a fabulous food, rich in vitamins and minerals. You may wonder, HOW do you eat nettles, if they sting you? Well, you harvest them with gloves (or very delicately), and then allow them to wilt. This usually renders the little stingers inert, and those that don't quite get there are destroyed by cooking. You just steam it like spinach. It's delicious with lemon and olive oil. Your liver will love you! Next plant I saw an abundance of was Cleavers also called Oatstraw (Galium aparine). Not overly tasty, but a good tonic steamed up or ground up or turned into tincture. Right along with it is Chickweed (Stellaria sp. ), which is in a similar boat, but is just fine raw. Add to a salad. My favorite of favorites, which is delightful as a salad green, either alone or together with regular garden or grocery lettuce, is Claytonia perfoliata, Miner's Lettuce. 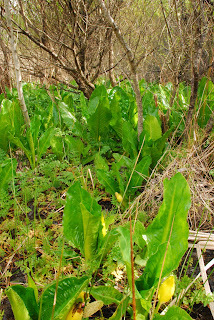 Early miners and settlers used this as a salad vegetable, with good reason. It tastes great! The lovely round, disc shaped leaves are carpeting the creek bench, and Ella really likes them. 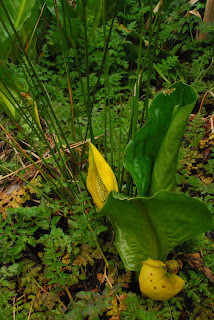 A plant we are seeing a lot of right now is the Skunk Cabbage, Lysichiton americanum. 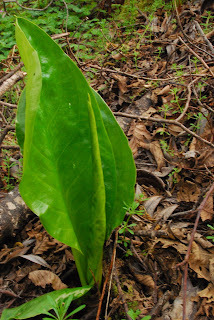 In January and February, it begins shoving these large and vibrant green leaves above the soil in our swampy places. There is no other plant like it! And right now, it has exposed its glaring yellow half-shell lily type flowers all over the marsh, permeating the air with a rather lovely floral aroma. Who thought it warranted "skunk"? I looked it up, but apparently, it was only edible as a last resort, when other food was in short supply. The Native Americans did use it as basket liners. It's just so cool, I wanted to share it with you. Last, but not least, is the common Cattail (Typha latifolia). 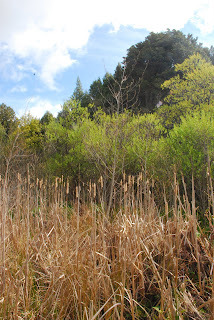 I have long known that cattails are edible, many parts of the plant, in fact, but I've never tried eating it. Today, I noticed the small shoots beginning to emerge from the swampy water, and decided today was the day to explore it. I picked three shoots, and then reached under the water to find a tuber, which my memory told me was the best source of food. When I got home, I looked up how to eat it. The young shoots are simply edible at the base. I took a tentative bite, and found the flavor quite mild and pleasant, and the texture very agreeable. With the tuber, you peel it, soak it in cold water to separate the starch from the fiber, and then pour off the water to harvest a flour. Maybe it's not the right time of year, but based on my experiment today, this would take a tremendous amount of material to produce even a cup of flour. I'm willing to try however, to see what it tastes like...look out Mattole potluck!